Note: Real life stuff kept this from getting posted earlier. Good luck to the team vs. MSU this weekend. Friday night, I went directly from a work event to the Michigan hockey game at Yost. I threw a jersey over my sweater and joined the flow of people streaming into the arena. I climbed up through the stands, higher and higher. Section 11 is off in the northeast corner of the building, shoehorned into the space behind the new "Lettermen Landing" they added in the most recent renovation. Row 1 doesn't even start until about 12 rows up from the ice sheet. I climbed to Row 19 and went all the way to then end...and saw this. I'd gotten my ticket just a few days before, after the game had already been proclaimed a sell-out, so I knew my seat would be bad. But I still expected it to be, you know, *there*. I ended up sitting behind a travel hockey team from Louisville, who behaved pretty much like 11-year-olds who play travel hockey. One kid, the most hyperactive of the bunch, was a big Notre Dame fan, and he was trying to convince the whole team to cheer for the Irish (and he had a lot to cheer about in the first six minutes), but the quiet kid in the Michigan hat was having none of it. Other than their practice of body-checking each other the whole game, they weren't that bad. I didn't end up sitting next a well-dressed young man with a dirty blonde brush cut and his mother. When they reached their seats, she started complaining about their tickets. Maybe a recruit that Rodriguez doesn't care that much about? Whatever the case was, they went off to improve their lot and were presumably successful. Michigan started off playing bad hockey. Notre Dame instantly was the team getting all the pressure, and they made it pay off. The first goal looked pretty soft to me, but the second was a good chance for the Irish. In the first six minutes, we put ourselves down by two goals and we were being completely outplayed. We were getting absolutely murdered on faceoffs, from what I saw, and the Irish penalty kill was very effective. The second period turned it all around, and Kevin Porter's slapshot was what set the tone. Matt Rust looked like he was going to be the goat of the period after taking a penalty for goaltender interference and later a completely unnecessary minor for cross-checking. But on his first shift after stepping out of the box he ripped a shot from the circle that Pearce would probably like to have back to tie the score at two apiece. The third was a battle up and down the ice. I thought we had shot ourselves in the foot when Chris Summers took a 5:00 major for checking from behind, but the penalty killers turned in a phenomenal performance. When Chad Kolarik took the puck on a shorthanded breakaway, the Irish had no choice but to take a penalty of their own, ending the threat. Aaron Palushaj had his own breakaway and was bumped on the shot. Pearce made the save and Palushaj, off-balance, crashed into him, taking the net off its moorings. Palushaj was sent to the box for 2:00 for charging, which...he couldn't possibly change direction on one skate, but if you're going to go that hard into the net, you can't be surprised when that call goes against you. The Wolverines killed that penalty off too, and despite the chances both sides were manufacturing, it looked like it was going to overtime. Instead, a scrum developed near the ND net as time wound down. Brandon Naurato tried to get a shot on goal, but was mauled by his man. His backhand instead slipped to Louie Caporusso who buried the game-winner with 20.3 seconds left on the clock as pandemonium erupted. What a fantastic game. Saturday night was a lot more boring, but I like it when we blow out our opponents. The Palace was nominally half-empty, but it felt like there were even more open seats. Red elected to dress 11 forwards and 7 defensemen, which was a little odd, but he later said that it was to avoid a situation like last night, where we found ourselves down to 5 defensemen for most of the 3rd after the Summers penalty. Notre Dame had their chances, but Sauer looked a lot sharper than he had on Friday. ND started Phillips, their freshman, and he had an off night. He looked to have Kolarik's shorthanded try well covered, but it leaked through and he never really recovered. It was a 4-1 game when he left in the 2nd. The Palace was like a morgue, despite the best efforts of some Michigan fans and the ND band. I really missed having our pep band around. From what we could tell, ND had some sort of strange chimera band, with members of the hockey band, basketball band, and a drumline wearing baseball jerseys. They were adequate, but they should never play "Soul Man". Two small sections in the arena were ND students, so there wasn't much of a collegiate feel to the game. As was mentioned elsewhere, the ice was pretty terrible. The promotions crew that usually works Pistons games helped make it worse during the intermissions, sliding around on the ice and gouging it up with plastic shinguards and grippers for their shoes. They fired a seemingly infinite number of t-shirts into the crowd (several of which were promptly returned to the ice when their recipients realized they were all ND shirts). The zamboni driver missed a wide streak near the middle of the ice in the first period. Awesomely, the refs forced him to go back out and redo the shameful patch. Finally, I hate it when I see our fans acting like jackasses, so it pains me to relate the story of two guys in their 40's who should know better. They stumbled to their seats in the first period and we could smell the reek of beer from 8 rows back. When the Notre Dame band played, Jackass #1 (in his Harley Davidson jacket) would stand up and flip them off, and his friend would occasionally join him, if he wasn't on yet another beer run. It was like watching a pair of 8-year-old kids who just figured out what the middle finger is and don't think their parents are looking. They also started trash-talking one of the college-aged ND fans near them, but I doubt they made any sense. In the 3rd period, when they were well and truly beyond smashed, Jackass #2 started throwing his jacket in the air when something good happened for Michigan. An usher came down to talk to them several times. Once, while the usher's back was turned, Jackass #2 threw his jacket in the air just to show what a badass he is. This makes sense when your mental age has been dialed back to 6. Of course the usher saw what he did, and shortly thereafter the two morons left. Hopefully they didn't commit vehicular manslaughter on the way home, though somehow I doubt it. First thing: More to come tomorrow on the ND series. Craig and I were in attendance at both games, so we've got a few words to say about that bit of awesome. I've been looking at Michigan's schedule for the rest of the regular season in the CCHA and wondering what we can expect in the second half of conference play. The Wolverines have a tough road ahead, with series against Michigan State and Miami in the next few weeks after having just despatched Notre Dame. They've been on a torrid pace, but with the high-quality opponents left on their schedule, there's no way they can keep it up, right? So I've tried to use a little math to project how teams in the conference will fall at the end of the regular season. I broke it down, game by game, and I decided that the difference in current winning percentage is the best barometer of the chance teams have of winning a game. Two teams with .500 records should have the same chance of winning a game, but a team with a .700 record should have a better chance than one stuck at .300. It basically projects a split, with Michigan having a slightly better chance than Miami of getting a sweep or an additional point. Before last weekend's sweep, it was predicting about 2.4 pts for Michigan off Notre Dame, which seems fair enough, considering the number of chances each team had in the third period of Friday's game before Caporusso buried the game winner with 20.3 seconds left on the clock. This is how the numbers fall for the entire CCHA for the rest of the year. I've included the pace that each team is on (which is solely based on its winning percentage) for comparison. As you can see, the Wolverines are on a pace for a 52.5-pt season, but the projection knocks them down to only 46.3 pts, which would have them going about 8-4 down the stretch. Considering that the team is 22-2-0 right now, at first glance this seems excessive. But consider that they're playing the two next best teams in the league a total of six times during that stretch and it's a little less unlikely. Each game we play is like a loaded coin flip; eventually it'll come up tails, even if we play bad teams. That's what happened in part with OSU earlier in the season. We ran up against a hot goalie when we weren't playing our best and we couldn't get a bounce to bail us out. Ferris, Northern, and Lake State are mediocre-to-bad teams, but they get six chances to run into us on a bad night. Still, I think the numbers are conservative; 9-3 is what I'd call a successful conclusion to the season. I think we split with Miami, and State wins at least one game off of us, probably two. And if the Spartans only win one, there's a good chance someone else steals a game. A 48-point regular season would be a magnificent achievement and position us well for the CCHA playoffs and the NCAA tournament. A 50-point season would be simply astonishing, and I can't even believe anything north of that is possible. Down this stretch run, I just want to see our guys keep playing sound hockey, take care of business against teams they shouldn't lose to, and make it to the tournament without injury. Let's see how this plays out. The Michigan hockey team plays Notre Dame at the Palace of Auburn Hills this weekend. As The Blog That Yost Built pointed out when the schedule was released, Notre Dame may be getting exposure in a new market, but it may not be worth it to give up their only home date against Michigan for what amounts to a road game less than an hour from Michigan's campus. Well, it seems that they're trying to reclaim the environment. While it's naturally going to be a heavy Michigan crowd, one staple of weekends at Yost will be conspicuously absent: The Michigan hockey pep band will not be in attendance. This is not due to conflicts or crowds. It is because Notre Dame is excluding them from attending. The hockey team liason explained to the band that "it is ND's home game and they did not want to allow [them] to travel." The band contacted the CCHA and learned that there is no official policy on home games played at neutral sites, but they would bring up this issue at league meetings this year. Red Berenson and the team told the MMB staff that the band's presence would "greatly improve the environment," and that their hands are tied. Incredible that this is deliberate. But band-related conflicts are not without precedent between these schools. The Notre Dame marching band has twice made problems for themselves when traveling to Michigan in the past. Michigan's long-standing policy of capping opposing bands groups at 330 members somehow became an obstacle for Notre Dame who was unwilling to write drill for a smaller group in advance. Ultimately, they complained publicly but still came without incident. And I think they came to Michigan this year too, though I don't remember hearing their fight song when they scored. I don't mean to suggest this is a retaliatory snub -- if they wanted to inconvenience the MMB they could've done so at the games in 2004 or 2006 -- just wanted to note that similar things have happened before. The Victors and the Notre Dame Victory March are unanimously revered among the top fight songs in the country and almost always appear #1 and #2 in pundits' lists. It is unfortunate that this attempt at neutralizing the Michigan faithful comes at the expense of some of the greatest traditions in college athletics, and not by circumstance, but by choice. Update: Notre Dame will indeed have its pep band there Saturday. The associate athletic director responded to an e-mail explicitly stating that since the Michigan band played at its home game on Friday, that "in turn, the Notre Dame band will perform at its home game on Saturday." 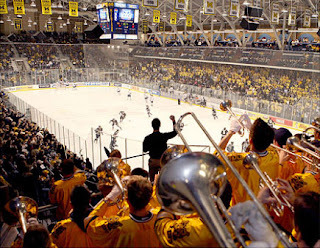 He said that during CCHA play, visiting teams' pep bands do not perform at Yost Ice Arena, and we should not expect Notre Dame to host a visiting band, since that is not customary in college hockey. He neglects to account for CCHA regular season games played at neutral sites, such as the annual Michigan-MSU hockey game at Joe Louis Arena, where both bands are present. And when LSSU played one of its home games at Joe Louis, rotating Michigan and Michigan State as opponents, both visiting teams' bands went. There's even a precedent for CCHA regular season games played at non-hockey venues: The Cold War. To which Michigan sent a band. 1). Graduation will not be held in Michigan Stadium. 2). Graduation will be held instead at Rynearson Stadium in Ypsilanti. On the first point, I certainly cannot say I blame you about being upset about not getting the chance to say goodbye to Michigan at Michigan Stadium. It's a change, it's a disappointment, but it's also a reality. Many of you are trying to use this manifest anger to find some sort of compromise that keeps graduation on campus, and I applaud that. Rational examination and constructive planning will be more likely to affect a positive outcome for your class. That said, you may not get what you want, and while there is some sorrow in that, it's also a reality of life. This is also the danger of Facebook and its ilk; your comments, made in the heat of your initial anger are forever recorded for posterity, waiting to be gobbled up by media outlets and bloggers looking for easy and cheap research on the topic. But it is on the second point to which I'd caution the direction that some of your anger seems to be taking. The insults, denigration, and whining about the ceremony being at Eastern are highly unbecoming. Eastern Michigan graciously offered to assist Michigan when it asked for its help and now is being treated by many of you as some kind of second class citizen, at best. This is not going to be constructive, but will, instead, cast your class in the eyes of many as one of elitist whiners and crybabies who think you're better than everyone else, including EMU. Often as Michigan students and alumni, we wonder why people denigrate us for an attitude of elitism, and yet we seem to be willing to ignore when we bring that denigration upon ourselves. It's not merely enough to say "No offense to Eastern/Ypsi, but..." and think that your offense will be ignored or forgiven. Even if your issue is not with graduation being on Eastern's campus, but rather that it's not on Michigan's campus, that is not how this issue is being seen. I'd like to think that most of you did not intend to offend, because you see this as an internal affair of Michigan campus politics and that no one else would care, but part of being a member of the Michigan community is that your actions and words are scrutinized by many in the state. You have the intellect and the knowledge to make better choices, hopefully you can mix in dose of wisdom to realize that discretion is quite often the better part of valor. So, if you'll forgive an old man for trying to help, if you want to make a change, focus your energy on keeping Michigan's graduation in the Big House or at least on campus, which is most likely what you want. Be courteous, think about how you feel and how it might be perceived by people, both inside and outside the Michigan community. Be thoughtful and understand the realities of the situation. Be clear about what you want and understanding if you cannot get it. Thank you and good luck as you begin your last semester in Ann Arbor. Cheering for the Buckeyes means wanting all those people to be really happy again. Though we've had to grow accustomed to it, OSU woofing is far worse than SEC woofing. Not to mention the edge in recruiting this would get them. An OSU win can only hurt Michigan. Geaux Tigers. The band is on the screen! A post at the commentating panopticon Awful Announcing expresses incredulity that Fox showed the WFVU and Oklahoma marching bands 58 times during last night's Sugar Bowl. We may be biased here at the HSR, but the cameras should be focusing on the bands at least that much. College marching bands are a consistent source of coordinated chants, animated cheers, flashy instruments, and students always cheering loudly. For all the work they put in they rarely get televised attention for it. With the notable exception of the Rose Bowl, pregame and halftime are rarely shown unless they can fit it in between commercials for whatever sports drink sponsored this presentation. Ironically, during the 29 theoretical times they showed Oklahoma's band, they were probably playing Boomer Sooner during each one. It's certainly not as annoying as USC's pep dirge (which they played at least sixty times during last year's Rose Bowl), but it doesn't help to look so uninspiring when you finally get the airtime. Anyway: We applaud Fox Sports' BCS bowl game producers for showing off an essential element of the pageantry and tradition of college football. Keep it up. Geoff: That was the best bowl performance I've seen by Michigan in a long time. Probably the most enjoyable one since Alabama in the 2000 Orange Bowl. Jeremy: I couldn't stop thinking, "Did I drink so much that I passed out and it's now January 2009?" Geoff: It was crazy. Empty backfield, passing to set up the run. Craig: I had that moment of "this could be something" when Arrington had the behind the back catch. And I just thought...wait a second, we CAN win this game. Which was, by the way, the first time I have believed that since the pairing was announced. Geoff: Me too. But I held out from getting too attached until just before halftime. Craig: Agreed. We've been down this road far too often. Geoff: Though getting Jake Long a TD would have been the cherry on top. Craig: Mike DeBord went into the secret folder in the playbook labeled "Plays NEVER, EVER to be used, under penalty of death." Geoff: DeBord needed a companion piece to '06 Notre Dame. Craig: By the way, Manningham was amazing, but Arrington was other worldly yesterday. He did things that should not be allowed under the physical laws of this universe. Geoff: He was operating on a completely different plane. Craig: And Henne reminded people that, when healthy, he's as good as any quarterback in the country. Jeremy: He made himself a lot of money yesterday. Geoff: This is a victory that's going to age well. I like having the next 9 months in front of me. Craig: Which makes me sad, because yesterday was "the Awesome Power of a Fully Operational Mothership"
Geoff: And one operating without training wheels. Craig: Did you feel like yesterday, Mike DeBord was like "Well, I need to update my resume. We're using everything..."
Geoff: He went all-out to add a few more clips to his reel. Craig: He genuinely seemed to be into it on the sideline, for whatever watching the backup quarterback is worth. Geoff: Maybe he's just a kid who likes watching his team win, but he didn't look like a guy about to transfer. Craig: By the way, is it possible that while not "good", three of the four turnovers were of the non harmful variety because they were so deep in the Michigan end (credit to Florida for driving 80 yards to convert off the one)? Geoff: They were definitely harmful because they took, at minimum, six points off the board. But at least they weren't handing the points to Florida. Craig: Was there some kind of strange karmic balance, wherein because Manningham and Arrington and Matthews did not have the treacherous hands, Mike Hart was required to do so? Geoff: Theoretically, I wouldn't have been shocked if Hart fumbled. But TWICE? Craig: You could just see on the first one, he was just incredulous, like "Really???" Jeremy: You could see it in his face too. The first time he was smiling, because of course it's going to be overturned. Geoff: I was waiting for it to go to review. Geoff: The second time, it was the same play as the Penn State game, except this time a guy put a helmet right on his hands. Craig: My point was, Hart was trying to get every last inch, the Florida player did what you're taught to do, dislodge the ball. Geoff: Oh, and Terrance Taylor blocked his second kick of the year. This time it was a Florida field goal attempt, but he also blocked a PAT during the EMU game. Craig: I liked that he got the "great work kid, but an idiotic penalty" pep talk from Coach Carr. Jeremy: By "pep talk" do you mean Carr roaring in his face for several seconds? Geoff: Anyway, it was a near-perfect ending to Lloyd Carr's tenure as football coach. I wonder what he'll be doing as an associate athletic director. Geoff: I think he'll find a way to get involved in keeping athletes on track to graduate. So much of his last locker room speech revolved around his guys finishing their educations. Craig: And I loved that about him, by the way, that it wasn't fake; he genuinely wanted that to be one of his big points. Geoff: The only other guy I've heard talk that much about getting your degree is Red Berenson. Craig: Hey, I smell a segue! Geoff: A segue to a GLI championship? Craig: I was lucky enough to be at both nights of the GLI and it may have been some of the best hockey I have seen in ages at any level. On Friday you had Michigan just coming out hot and doing it right with the 6-0 win over the skating Friars, with Billy Sauer turning away 44 shots. Geoff: I watched the 6-0 demolition of Providence. That was something else. Craig: That was followed by one of the singularly most entertaining GLI games I had seen in my life (1997-present) in the Michigan Tech victory over State. Geoff: Definitely. It's hard to root against most of the teams from the UP. Craig: And Michigan State ran into a goalie in Nolan who was that insane combination of good and lucky. Craig: Couple that with State losing the Champs Sports Bowl in the middle of that game, and it was just a bad night for little brother. Geoff: Brian Hoyer just threw another interception. Craig: So that set up Saturday, which had Providence beat a demoralized Michigan State followed by a game that can only be described as epic. It's my conclusive proof that a game with just one goal can be the most compelling thing possible. Posts left and right, great glove saves, great blocker knockaways, an ever-increasing level of chippiness, lots of power play chances but Nolan up to the task EVERY time, and finally, in the second overtime...making it work. Craig: Billy Sauer deserved tournament MVP honors and he is emerging as the goalie we all wanted him to be when he got here as a 17 year old. The defense stepped up, including Scooter Vaughn, of the California Vaughns. Tristan Llewellyn and his new game show sensation sweeping the nation..."Is it British Enough...with Tristan Llewellyn?" Porter making more of a case for the Hobey Baker with each game. And a nice way to get off the schneid in the GLI and aim towards the next six weeks, which will tell us much more about the team than we probably want to know. But if Sauer can keep playing at this level, Michigan is for real. Geoff: It's been a special season for this team, and I want to watch them as often as I can. Jeremy: Any thoughts on that e-mail we got? "Ok, so you guys probably have at least a little more insight into the workings of the MMB than I do. Why, during the Capitol One Bowl, did they play their entire pregame and halftime facing the sideline opposite the Michigan section?" Jeremy: I suggested that because the Michigan section was opposite the press box, which is ultimately the "focal point" of the performances, and on-the-fly adjustments are hard to make. Geoff: Yeah. We generally play to the press box, even if our fans are on the other side. Jeremy: It's possible that even if they wanted to, they couldn't start pregame from the press box sideline because of equipment or people with field/press passes already taking up too much space. (Remember, pregame entry lines form on the sideline during away trips). To the MMB readers, if this was ever addressed on the trip, certainly chime in and let us know. Craig: Honestly, looking at crowd shots, was there a Michigan side yesterday? Geoff: There was a Michigan corner. That was about it. Craig: I know there was, but it just felt like 9:1 Florida/Michigan ratio. Geoff: Not bothering to play to the opposite sideline is something of a pet peeve of mine. Jeremy: We even saw bands playing to both sidelines at once this year, so we know it's possible. Geoff: Yeah. And we should also note that the band took the Modern Broadway show with them to Orlando. So that's three times this year Carl has had to avoid saying "Springtime For Hitler." Jeremy: That's right where ESPN started showing it, too. I was hoping maybe the commentators would tell us the song. Craig: I looked around the room at the viewing party yesterday with three other MMB fans and we all smiled at the fact that that was where they came in. Craig: So, shall we wrap this up gentlemen? Geoff: For hockey, we have the USNTDP next Tuesday, a home and home with Western, then things start getting real with ND and MSU in back to back weekends. Good luck to them as they come up against the meat of the schedule. Geoff: And good luck to the departing assistants from the football team. Jeremy: I'd hire Jeff Casteel right now. Craig: And to Mike Hart, here's to hoping we see you back in Ann Arbor in 25 years...as the new boss. Jeremy: Craig, I think that's definitely going to happen. Craig: To Coach Carr, I've said all I can, so I now merely say thank you. Geoff: Thanks to Coach Carr for everything he's done for this program over the last 28 years. Craig: To the Seniors: You will not be forgotten. Whether that's a good thing or not remains to be seen. Jeremy: Adrian Arrington said it very well: "He took a lot of boys who thought they were men and turned them into real men." That is no small task. Geoff: And I think we're done. Thanks, guys. Craig: Thanks Geoff, Thanks Jeremy! Happy New Year. Jeremy: Great start so far! Goodnight. What a fantastic way to send off Lloyd Carr, Jake Long, Chad Henne, Mike Hart, and all the other seniors, and what a weird game. The offensive might we'd been expecting all year was on full display, with Adrian Arrington having a monster game and Mario Manningham showing off his speed with a flurry of end-arounds. Mike Hart showed that he's human, losing two fumbles on the goal line, but he also ran for one touchdown and 129 yards on 32 carries. On special teams, Michigan was the team blocking a field goal for once, and we recovered an impromptu onside kick when Florida declined to field the second half kickoff. The offense gave the ball away 4 times and the defense got zero takeaways, but the team came out of it winning the only battle that matters, the one that reads 41-35. As a swan song for the Carr era, this was tremendous. Thanks, Lloyd.